A comment that repeats the name of the function. What a waste of time and space! Certainly, the name of the function is super important to documentation. However the name should work with more context to understand why a program was written the way it is and why that function is needed. In our embedded systems section of Contextual Electronics, Ron showed us how he uses Doxygen and Graphviz to document code. I like having the documentation within the same location as the source. I found this post by Erich Styger to be exceptionally helpful in understanding what was going on. Thank you Erich for your well written advice. 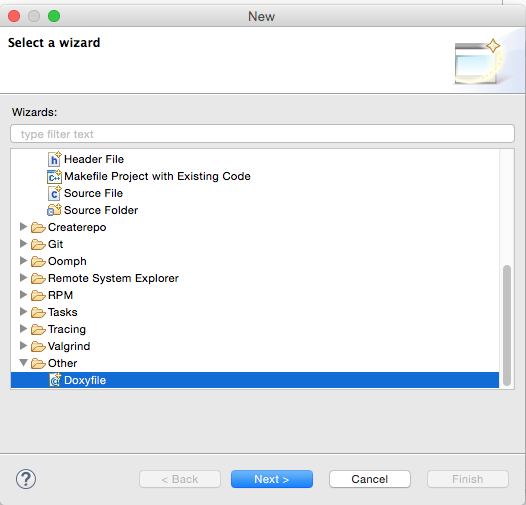 The goal of this post is to add documentation to an Eclipse project (running on Mac OS X 10.10) – LED_TEST. 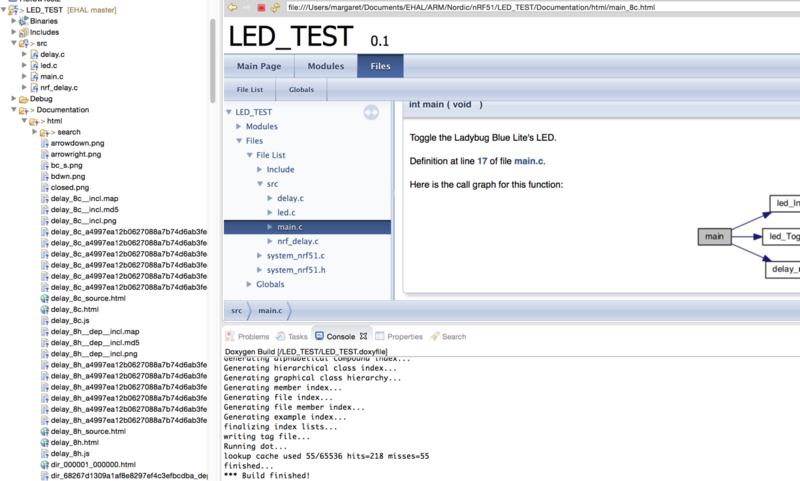 LED_TEST is a very simple project I will be using to test the LED I have laid out on the LadybugBlueLite PCB. I provided example Eclipse projects that use the NRF51 SDK in this GitHub repository. I peppered the source with Doxygen commands. Each contain a Documentation folder where you can view Doxygen’s output (open up the index.html file). The examples are located here in this GitHub repository. Doxygen can be installed from this link. I downloaded Doxygen-1.8.10.dmg (56.0MB). I copied Doxygen.app into the Applications folder. As pointed out in this post: Graphviz is open source software to create graphs using the dot language. Dot code can be used with Doxygen. I downloaded Graphviz from here. From what I can tell, the only thing used is the dot command line tool. Dot seems to work with either of the versions. I’m not completely sure because I was fiddling around trying to get graphical views to work within Doxygen. I’m pretty sure (but not positive) my challenge was not in the version of graphviz. Since December the 1st of 2009, the development and the maintenance of eclox are discontinued ! See Getting Involved to get information about development resources. Despite the notice, I am throwing caution to the wind and going ahead with Eclox. Risky, I know, but…I optimistically believe the gain will be worth the risk. 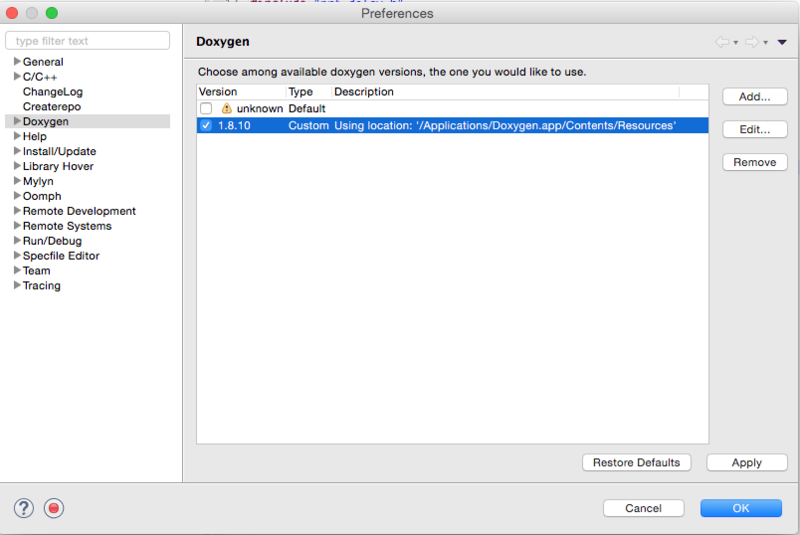 Tricky part: Assuming you did like I did and copied Doxygen.app into the /Applications folder, the location of the Doxygen binary is located within Doxygen.app within the /Applications/Doxygen.app/Content/Resources . If you are not familiar with OS X application bundles, this wikipedia article may be helpful. 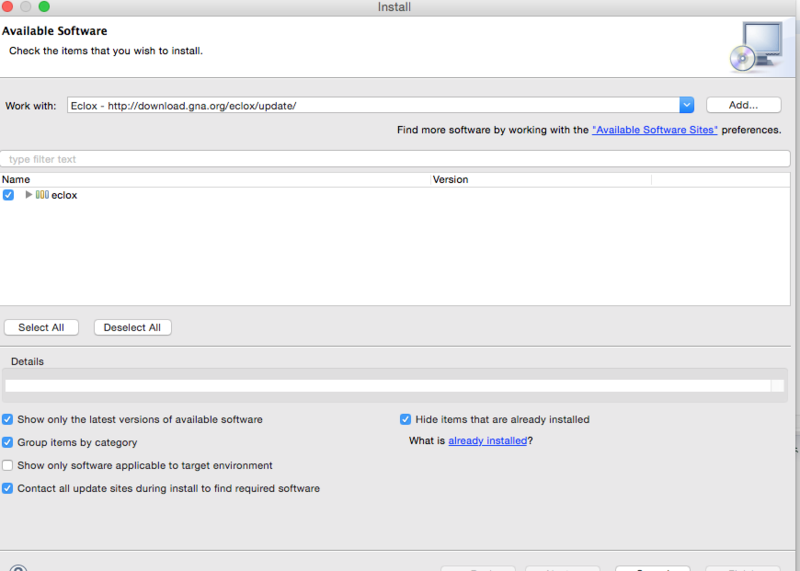 You know you have been successful if you see the version number. Each Project needs a Doxyfile. As noted in the Doxygen documentation: [The doxyfile] configuration file is a free-form ASCII text file with a structure that is similar to that of a Makefile, with the default name Doxyfile. It is parsed by doxygen. Eclox adds a wizard to create one. Go to File -> New -> Other -> doxyfile . I used the settings above. However, I needed to set a few more properties before I could get the Diagrams to be generated. 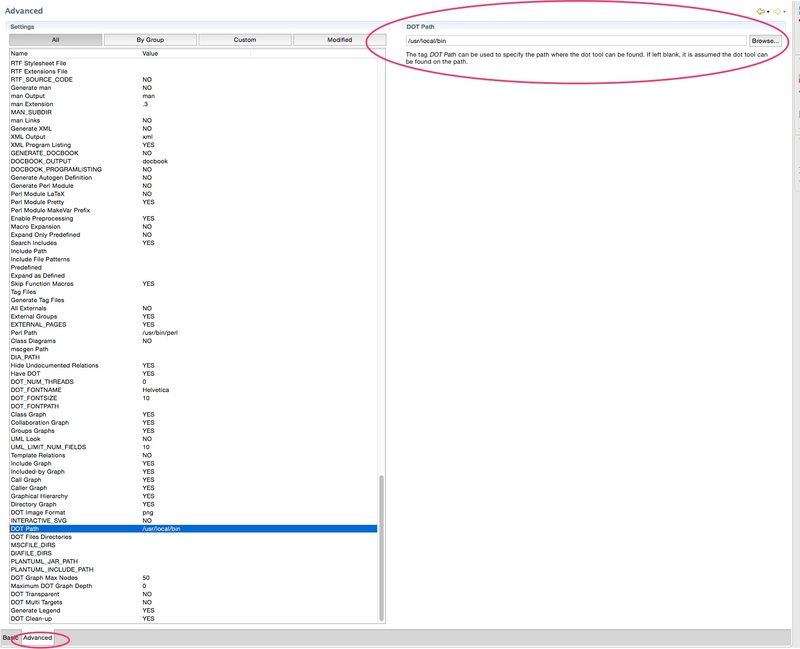 The additional properties can be set by going to the properties in the Advanced Tab. The Advanced Tab is located at the bottom of the editor. Hurdle: Don’t forget DOT_PATH . 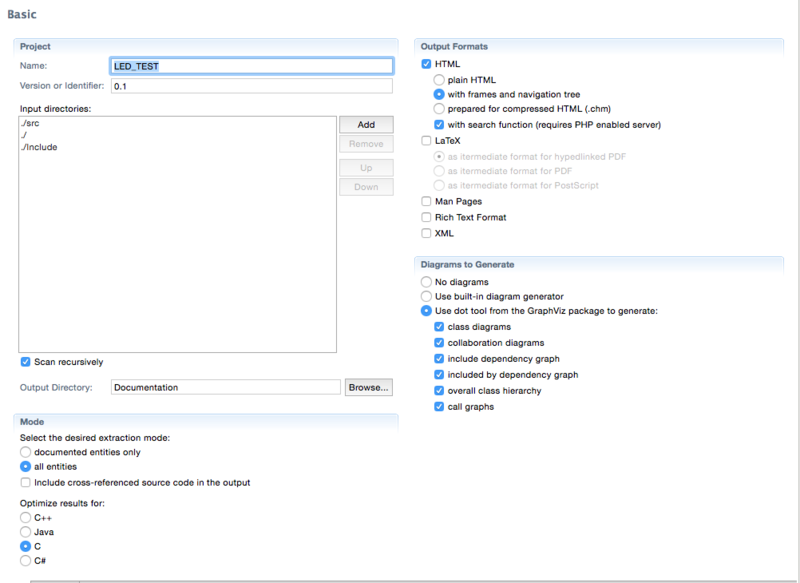 Without it defined, Doxygen can’t find the dot utility provided by the GraphViz install. Tip: When in the Advanced tab searching for a variable, go into the Custom Settings Tab and enter a search term like “DOT” to narrow down the properties to the ones you want. You may want to modify some or none of the above. Perhaps splash around and find out what works for your project. TRICKY: I could not consistently generate call graphs UNLESS I included the \callgraph Doxygen command in the function’s description. 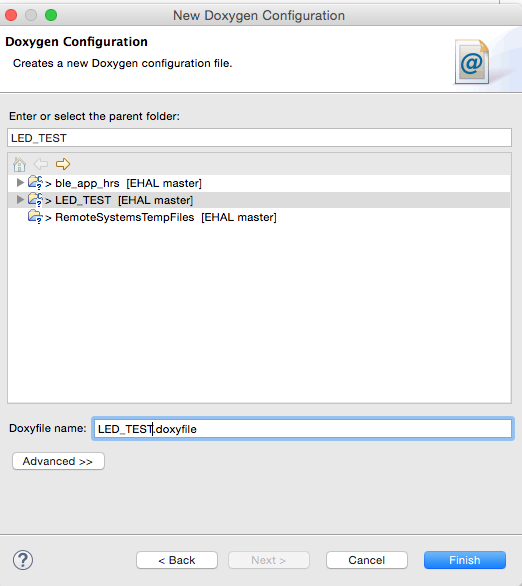 USEFUL: Eclipse makes it easy to enter Doxygen commands. Start a line with /** then hit enter. press the button to generate documentation for the opened project (or choose the project). A whole bunch of documentation files will be placed within the folder defined as the Output Directory in the Doxygen Editor step above. 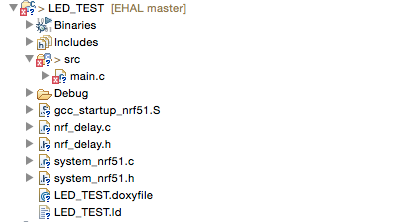 I set my Output Directory for this project to Documentation. 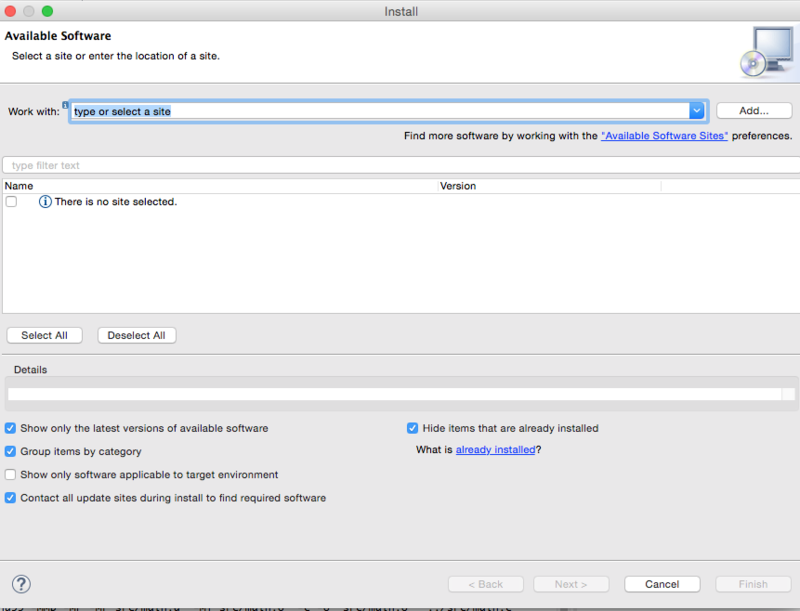 Double click on the index.html file to open the documentation within Eclipse. From here I can jump to the source documentation (note “line 17” and “main.c” are in blue). Also, there is a call graph that makes it much easier to follow what is going on. While I am new to Doxygen and Graphviz (the Dot utility), so far I am finding many positive reasons to consistently use as part of my programming process. The call graphs have been a great way to sift through the NRF51 SDK and gain a better understanding of what the libraries are up to as well as what code I should look at more closely.